Fiona and Josh were married on 4th August The Barn at Barra Castle. "We got engaged on 25th November and married the following August – something of a whirlwind but it worked for us." Huge thanks to the lovely Hayley Fraser for sharing her images of the day. You can catch Hayley on her website, Facebook or Instagram. "The Barn was a bit of a gamble as it was still a building site when we viewed it in January 2017. A gamble though, that completely paid off! 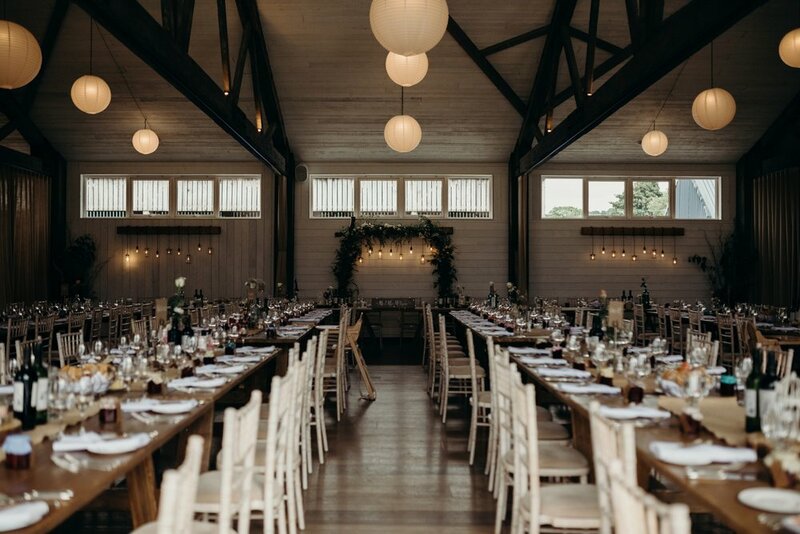 The Barn is a stunning, blank canvas venue and being only five miles from my parents’ house I was able to get married from my childhood home." "I really enjoyed the way that planning the wedding brought me closer to not just my own family and friends but also my partners’. I had numerous messaging threads that were always active. It was great to incorporate everybody’s ideas and create a day that was special to everybody involved." "Shortly after we were engaged my partner was offered the job of a lifetime in Denver, Colorado. He moved out in March 2017 so we made a big effort to get all the major things booked before he left. We decided on venue, date and caterers together then I took the lead on the remaining details when they came around." "Planning a wedding with someone based on a separate continent (and on a seven-hour time difference) from you is not easy and I wouldn’t recommend it; but we managed! There were a lot of long emails and a few grumpy late-night phone calls but on the whole, we really enjoyed the planning process." "Three days after the wedding, we both flew out to Colorado to start our new life together. Best leaving party ever!" "My Mum and I went shopping for my wedding dress together. I had a pretty clear idea of the kind of dress I was looking for – something ‘20s with not too much skin on show. I’ve always loved that era and it was particularly fitting given that Josh proposed to me at a vintage jewellery market (http://www.graysantiques.com/) where we bought my art deco engagement ring. We found my dress on our first outing, though I went to visit it two or three times before we made the final decision. It was an Eliza Jane Howell dress called Sylvia purchased from Perfect Bride on Holburn St in Aberdeen." "The finishing touch was a beautiful bespoke headdress from Hermione Harbutt in Bristol. Josh and I lived in Clifton for a year when we first got together and I used to walk past Hermione’s store regularly, fascinated by the beautiful pieces in her window. We designed the piece together and she turned it around in less than three weeks. One of my bridesmaids spent a sleepless night on the overnight Megabus from London to Aberdeen carrying the headdress on her lap!" "We had a civil ceremony – neither of us are very religious but it was important to us to make it as meaningful as possible. We wrote the ceremony together and chose traditional vows, we included the Scottish Quaich ceremony which was really special. We used water from Northumberland where Josh is from and Glen Garioch whisky which is distilled on the mountain you can see from the venue. It was a real novelty for our non-Scottish friends and relatives!" "My favourite part of the day was our photoshoot with Hayley and Craig after the ceremony. Josh and I are both super awkward human beings and we were dreading the prospect of professional photography. However, Hayley did a fab job of putting us at ease during our engagement photo shoot (included in our wedding package) and we were delighted with the images. On the wedding day, the photoshoot was a lovely quiet time for Josh and I to catch up and spend some quality time together." "There were so many amazing details at our wedding and so many fabulous people contributed to making it so special." "Whenever Josh and I have visited his Mum we’ve left the house with our bags laden with hand-made jams and chutneys. With this in mind we asked his mum if she’d be interested in making 150 jars of jam for our wedding favours. She took our proposition as a challenge and together with her husband worked for weeks to produce jar after jar of strawberry jam. Jam that went on to win first prize at the Harbottle Show no less!" "In terms of catering, we really liked the idea of having an afternoon tea after the ceremony rather than the usual canapes and Hudson’s were amazing at listening to our ideas and designing a beautiful array of finger sandwiches, scones and chocolate coated strawberries for our guests to enjoy." "Neither Josh or I are very artistic so we were extremely lucky to have a number of skilled people willing to step in and help us with the aesthetic of the day. Josh’s incredibly talented little sister, Catherine Jones, took some time out of her A-level studies to design and print our beautiful wedding invitations. We recommend her for an A*! One of my bridesmaids happens to be an extremely cool illustrator; she designed and made our amazing seating plan and our gorgeous name cards. She really tied everything together and her designs were perfectly sympathetic with the rustic venue. We had stunning bespoke signage made for us by Heilan’chic which really made the day our own. It was the perfect finishing touch and I can’t recommend Linda highly enough!" "My clearest memory is of peeking through the curtains before I walked down the aisle and realising that all my favourite people in the world were in the room waiting for me. Suddenly all my nerves disappeared and I was ready to enjoy the day to its fullest!" "My advice would be to involve as many people as possible in the process. My family thought I was mad for having nine bridesmaids but I loved being able to share the experience with so many special people!" "Remember that there’s no harm in listening to everybody else’s ideas and then using them to inform your decisions. At the end of the day they’ll appreciate that you listened to them and won’t hold it against you if you still decide to go your own way." "Oh, and if you have to send two of your bridesmaids cross-country on the morning of the wedding to retrieve your wedding pants, make sure to double check you really have put them in your overnight bag by accident, and they’re not actually still in the house…"
"Jennifer Colquhoun is an extremely talented illustrator who produced all of our place settings, labels and seating chart in her own (very cool) handwriting. We know her well, so we were happy to let her do her own thing, but she really thought about the details and tied her designs into the wedding aesthetic. She referenced the illustration on our invites in the seating chart and was totally happy to compensate for last minute guest changes, so everyone felt really special."